Since 1982 Plantation Shutters have been synonymous with superlative quality, imaginative and distinctive design and exemplary craftsman ship and service. Over 37 years later Plantation Shutters have remained true to its original company ethos and maintained its core principles. Our team of specialist woodworkers, joiners, designers have always played a pivotal role in the company and are dedicated to producing the highest quality designs with meticulous attention to detail. Hassle free, cost-effective specialists, here's what we provide: • Advice and questions answered • Quoting • Measuring – site surveying • Installation • Supply only service - UK Mainland • Integrated Room Darkening Blind alongside Shutter Solution. • Customised Shapes • Bay Windows / Doorways / Velux • Custom Colour Matching – Paints and Stains • Ranges of Craftwood MDF, Hardwood, White Teak, Waterproof shutters, and Aluminium security shutters, Solid Panelled shutters. • All design styles – Full Height, Café style, Tier on Tier and Shaped Shutters. • Additional Honeycomb Blinds and Venetian Blinds. Enthusiastic and dedicated, there is no project too big or too small. We relish in being both extremely helpful and technical. Exceptional shutter quality and flawless service, creating the perfect solution for each project with value for money. Want to book a site survey with one of our in-house experts? Request a call back. Any questions or queries? Contact the office. Looking for idea of cost? Get an online quote. 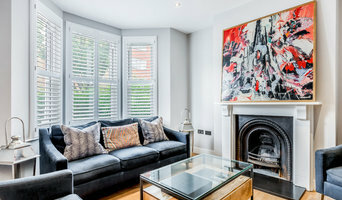 The Shutter Shop is a family run business and the UK's leading window shutter expert, specialising in the supply and installation of the finest quality, custom made interior window shutters. We have a showroom located in the heart of the Chelsea Design Quarter, Fulham, London. Leading the way in style, innovation and customer service, we have dressed the windows of homes as well as yachts, hotels and offices for over 30 years. Each shutter is meticulously hand-crafted and customised to fit your window perfectly. We offer the most extensive range of window shutter options available in the UK, from product material to style, shape, size, colour and hardware. The Shutter Shop also supplies and fits a range of window blinds including honeycomb, roman, roller, blackout and Venetian. We can provide you with a full survey, measure and fit service or we also offer a DIY option. Get in touch with the office for more details or check out our website! June Perkins Interiors is one of London's finest bespoke soft furnishing manufacturers offering high quality, traditional craftsmanship and contemporary design on a full range of bespoke curtains. blinds and accessories. We are an independent, family-run business based right here in London with all work being produced by hand in our workshop in Battersea. Who We Work With: We are London based soft furnishing makers and we specialise in made to measure curtains and blinds and accessories for design conscious homeowners & interior designers. London Based Workrooms: With our own workroom in Woolwich we have complete control over the quality of work and this enables our team of expert project managers to effortlessly deliver bespoke projects from conception to completion. Dedicated Measurement and Fitting Team: Our expert project managers are here to help with everything from measuring, detailing and finishing and fitting and installation, which is completed by our two dedicated curtain fitting teams. Electric Systems and Home Automation: At Sue Whimster Curtains, we pride ourselves not only on our craftsmanship and commitment to quality, but on keeping at the forefront of the most up-to-date technologies and treatments in the industry. We can help you realise your electric curtain and blind project using industry leading systems from Lutron, Silent Gliss and Creation Baumann. Services: . Made to measure curtains and blinds with fitting services . Electric curtain and blind systems . Reupholstery of furniture and headboard making . Cushions, bed dressings and other accessories Our workroom produces high quality hand finished curtains, blinds and accessories. Premium blinds and curtains, without premium prices, delivered to 100+ countries. The Voila Voile supply premium fabrics. Our expert tailors manufacture curtains, blinds and voile curtains to your exact specifications. Our website has useful tutorials that help you to measure your curtains and blinds. You can find the instructions here: <a rel="nofollow" target="_blank" href="https://www.voilavoile.com/docs/index/advice.htm">https://www.voilavoile.com/docs/index/advice.htm</a> You'll get an immediate quote and you can order FREE fabric swatches online too. If you have any questions, our experts Anita and Dylan are on hand via phone or email to walk you through the process and give any advice that you need. We want to inspire you to create breathtakingly beautiful rooms using the finest materials. Voila Voile Curtains & Blinds - a colour for every taste, a price for every budget. P.S. We are also happy to make curtains and blinds in your own fabric. Please email us your curtain size, heading, lining requirements for a quote. Judith Strong Design offers beautifully crafted, made to measure curtains and blinds as well as soft furnishings for both contemporary and traditional projects. Judith's design background makes her the ideal choice to provide advice on the best fabrics and colours, for the finishing touches to your ideal home. Choose from our extensive range of quality fabrics or supply your own. Bespoke, made-to-measure curtains and blinds are supplied throughout South West London, Middlesex and Surrey including Richmond, Teddington, Chiswick, Barnes, Weybridge and West Byfleet. Call now to discuss your projects. Home décor boutique bringing beautifully crafted soft furnishings, upholstery and accessories to West & South West London, Richmond, Kew, Kingston, Twickenham and Sutton. At Lemon and Grey we have a great passion for creating bespoke curtains and roman blinds, together with matching accessories to suit your personal needs and tastes. These include: upholstery, cushion covers, table mats and runners, bedcovers and quilts. Choose from a wide array of wonderful fabrics, brought together in 160 collections: from contemporary or velvety to classy and sumptuous, to chic or flamboyant. Designs are innovative or classic, with a versatility that makes them suitable for both residential and commercial properties. With great care we assist our customers with the selection of fabrics, measuring, estimating, manufacturing and installation. Drop us a message or call 07427 554542 to book a private consultation, by appointment at the boutique or customer’s site. Let us inspire you and take you through our collections! Pret A Vivre specialise in made to measure curtains and blinds. We have five London based showrooms in Fulham, Islington, Notting Hill, Muswell Hill and Wimbledon. Our service is unique in that we offer a finite range of fabrics which we make up into either curtains and blinds and show these on our website and in our showrooms. Our fabrics are sensibly priced ranging from £25 - £65 per metre approximately. This approach helps our customers to visualise and make a decision. We offer a personalised service with our design consultants offering expertise advice on technical aspects of curtains and blinds and style and colour advice : all the team are very familiar with the most well known designer brand paints so can give guidance on which fabrics will work well with any given paint scheme. A personal approach to designing and creating window treatments Established for offering a relaxed and non-pressurised service, I am a professionally trained curtain maker providing bespoke hand-made curtains and roman blinds in South West London and Surrey. I visit clients in their own homes to discuss the project, measure and provide guidance on window dressings and concluding with a final visit to hang the curtains or blinds. I have been commissioned by architects and interior designers on a number of projects to assist their clients in achieving a high-end finish to their curtain treatments. My specialty is bespoke curtain design for those clients wishing to achieve a unique design edge to their window treatments. This commission involves a series of design drawings and fabric combinations. We are a family business with over twenty-five years experience in the design, creation and fitting of ‘made to measure’ curtains, blinds and soft furnishings. Our aim is to provide everyone with a service that combines expertise, efficiency and style with warmth, friendliness and genuine customer care. Over the years we have become specialists at bay window treatments as well as curtains and blind cleaning. We also offer an Interior Design service as well as upholstery and re upholstery. Our approach is based on helping everyone to create a home that works for them – whether that is something that follows the latest interior design trends, or a more relaxed and personal expression of your own style. There is a solution for everyone and we offer ranges and solutions to suit every budget. Over the years we have also become experts at cleaning curtains in situ, we also offer a take down and re hang service and ultrasonic blind cleaning. Please visit our website for more information on this service. We are made-to-measure curtains and blinds specialists. Instead of sales people or reps, our company is made up of soft furnishing specialists who give you the best advice each time. Our curtains are made in our workshop in the UK; this ensures each made to measure curtain or blind are made to the very highest British standard. We offer onsite appointments where we gain an understanding of what you are looking for, including styles, designs and fabric that choices that could be suitable. We will then send through via email a quote, and show you samples of fabrics. Our business has been built on our expert advice and personal service and most of our work over the years being through recommendation. We are able to cater for all project budgets from small roller blinds to opulent and lavish swags and tails. Amanda Gregory Soft Furnishings is dedicated to the creating bespoke, handmade curtains and blinds for your whole home. We are passionate about using high end fabrics to custom make window treatments that suit the style of your home and your taste! Whether you are looking to inject personality into your new build home or refresh your existing period property, we can help by handcrafting bespoke curtains and blinds that suit your decor, whether it's traditional, country style, modern or contemporary! We offer a friendly, professional and personal service from initial consultation, fabric choice, colour matching and ordering, through to the delivery and full installation. We import textiles worldwide and have experience working with all variations of fabrics. Get in touch with us for a free consultation and estimate! 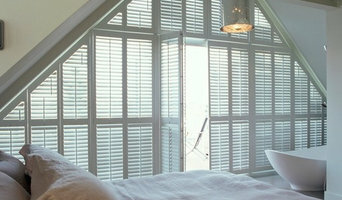 At London Interior Shutters we love period properties and architecture. Understanding the various components of a property allows to ensure every shutter we design and install is the best for our clients and their property. With every shutter we assess the aesthetics, architectural features functionality and client specifications. Curtain makers, retailers and designers in Uxbridge, Greater London can work wonders with pieces of fabric, while fitting blinds or shutters can be tricky to do yourself, so it’s definitely a wise idea to hire a window dressing professional in Uxbridge, Greater London who can design, make and/or fit bespoke blinds, curtains or shutters for you. 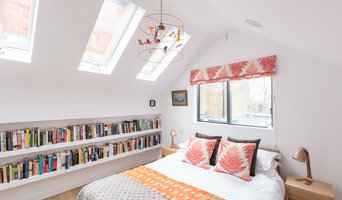 Whether you want sleek roller blinds for your home office, roman blinds for your kitchen, venetian blinds to smarten up your living room, plantation shutters for your bay windows or delicate voile curtains for the bedroom, there will be Uxbridge, Greater London curtain makers, blind fitters or shutter company to help you with your ideas on Houzz. A curtains, blinds or shutters company in Uxbridge, Greater London will first be able to advise you on the style of window dressing that will work with your windows and rooms. If you have an idea or design in mind for your window dressing, then discuss this with any potential experts, such as curtain makers in Uxbridge, Greater London, to see if your design and style is possible. You will need to work closely with them if you are planning on having custom curtains, bespoke blinds or shutters created. Curtain makers will be able to turn most fabrics into curtains, so if you’ve found a pattern or fabric you like already, present this to your Uxbridge, Greater London curtain makers and they could be able to turn it into curtains for you. Even when clients don’t have certain fabrics in mind, curtain makers can suggest fabrics based on your style and the rest of the room’s design. They can pick out the right weight, thickness, length and pattern that would suit your room. Curtain retailers in Uxbridge, Greater London will offer a huge range of readymade curtains, or curtains that can be adjusted or made to order. 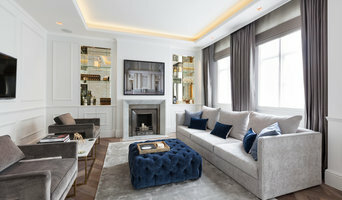 Contact Uxbridge, Greater London curtain retailers if you’d prefer to choose from a large selection of ready-to-go curtains; whether they are high-end designer curtains or just plain white curtains; rather than waiting for some bespoke designs from a curtain maker that may take a bit longer. You may find that curtain makers in Uxbridge, Greater London also offer a stock of ready-to-go curtains, too, but always double check with the professional first. Once you’ve decided on a design, curtain makers, blind fitters and shutter professionals will usually measure your windows or doors to ensure a good fit. If you are having blinds or shutters made then it will probably be best to have them professionally installed, too. Blind fitters and shutter companies should offer this service with their products as blinds and shutters need to be firmly fixed to the windows; something that most homeowners don't know how to do themselves. Although roller blinds and Roman blinds can be fairly simple, vertical blinds and Venetian blinds can be a bit more complex, and if you want remote controlled blinds that operate with the touch of the button, then you definitely need to call in the Uxbridge, Greater London blind fitters. 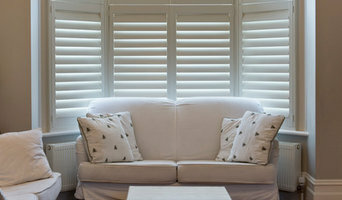 Plantation shutters are substantial window dressings and need careful measurements and installation, so it’s really best to leave the measuring, design, manufacture and installation to a professional Uxbridge, Greater London shutter company. Blind fitters, shutter companies and curtain makers in Uxbridge, Greater London should also check the insulation of your chosen window dressing and make sure there are no potential hazards once fitted. Finally, they should confirm with you that your curtains, blinds or shutters are functioning as you’d like them to before finishing the job. What should I ask Uxbridge, Greater London curtain makers, blind fitters and shutter professionals? Find curtain makers, blind fitters and shutter professionals on Houzz. Narrow your search in the Professionals section of the website to Uxbridge, Greater London blind, shutter or curtain maker professionals. You can also look through photos to find examples of Uxbridge, Greater London window dressings that you like, then contact the curtain retailers, blind fitters, shutter professionals or curtain makers in Uxbridge, Greater London who worked on them.